We offer a high-quality torque meter from DATAFLEX® for torque and velocity measurement. The DATAFLEX® Torque Meter works on the basis of a tensometer technology combined with modern electronic components. 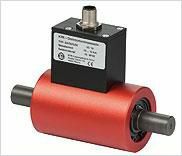 The range for small torque measurements is + -10 Nm, +30 Nm, + -50 Nm, speed measurement 2x360 pulses / revolution, 90° phase difference. Complete information and technical parameters can be found on our website.